This large, square picture book opens to endpapers of startling brightness. They depict an intriguing patchwork of fabrics, many and varied, to halt the eye, but what have they to do with the front cover and title? Indeed, the word ‘shenanigans’ in the title demands explanation! Off goes the rhythmical text, bouncing over the pages, as Lou Pine (a wolf of course) sneakily, slyly sneaks up on the flock of sheep, imagining his supper that night. ‘Scram! Vamoose!’ bellows Rambo the Ram, boxing gloves clenched, as the wolf beats a retreat. Wolf’s wiles are many and varied as he attempts to trick the flock with his tomfooleries. Finally he hits on a plan to visit Little Red Riding Hood’s Grandma, to get her to knit him a woolly jumper. Here we see Gran’s magnificent patchwork quilt from the endpapers, whilst wily Gran employs shenanigans of her own! There’s a wonderful denouement, announced by a shadow, for the keen-eyed. 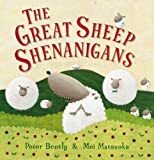 The pictures match the text perfectly; pictures just as zany as the language, both of which were loved by the children with whom I shared this book. They chanted some of their favourites, flicking through the book time and again: ‘stunningly cunning’, ‘lamb vindaloo’, ‘vamoose!’ ‘derrière’, ‘skedaddling’, ‘kersplat’. 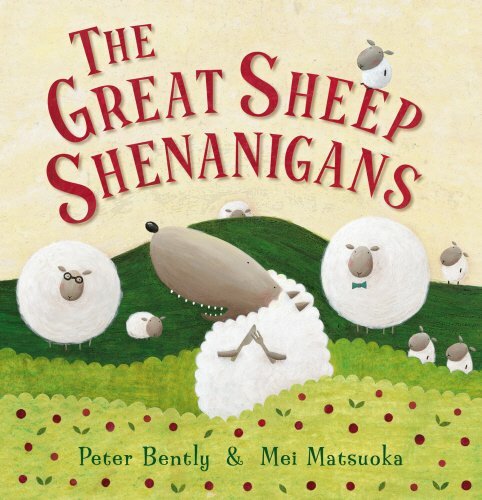 With its rollicking, rhyming text and dramatic illustrations it is an irresistible romp, bound to be a favourite across a wide age range… and great fun for adults too.